With a focus on changing job tasks and knowledge requirements for professionals, this book enables readers to meet the demands of designing, implementing, and supporting end-to-end IPTV systems. Additionally, it examines IPTV technical subjects that are not included in any other single reference to date: Quality of Experience, techniques for speeding up IPTV channel changing times, IPTV CD software architecture, Whole Home Media Networking, IP-based high-definition TV, interactive IPTV applications, and the daily management of IPTV networks. 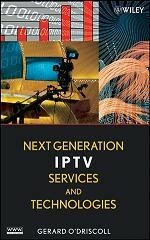 Additionally, this book examines IPTV technical subjects that are not included in any other single reference to date: Quality of Experience, techniques for speeding up IPTV channel changing times, IPTV CD software architecture, Whole Home Media Networking, IP-based high-definition TV, interactive IPTV applications, and managing an IPTV network on a daily basis.